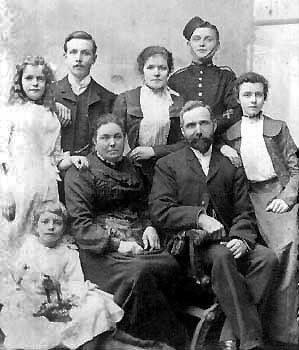 A rare fin de siecle photograph of the patriarchal Jonah at the head of his ever burgeoning family. His Austrian-born wife, Heilbron, had been hand-picked by Josiah both for her child-bearing girth and her resistance to pain. In order to prove her suitability in the latter her domineering father, the Alpine industrialist von Kreemer, had given her twenty-five consecutive blows to the head with a club hammer in front of an openly admiring Jonah. When he saw that she was dazed but still conscious he seized her for his bride. The twenty-five year old James (back left) now sports a moustache, whilst his younger brother Jack wears a new uniform with a jaunty 'pill-box'. Family records show that Jack had recently received his father's consent to begin work at Otis Elevators in Stockwell, London, finally allowing him to fulfill a lifelong ambition to become a lift attendant. Between them stands their sister Jasmine, mother already to ten-year old Jesse (bottom left) later to begin wearing male clothing, change his name to 'Bill Fivestars' , and pursue a career on the stage. Jonah and Heilbron are flanked by Jill (left) and Jacqueline (right). Obtain more information on Jonah's business manipulations.